So you’re running late for work because you hit the snooze button a few times too many. You turn off the shower, face the mirror, and… have to wait for the fog to clear. You frantically wipe it down, only for it to mist up again almost instantly. You give up trying to shave/tweeze your eyebrows, and that stubble/stray hair gets you FIRED. Then you wake up and realise it was just a dream, because you bought a fogless shower mirror and this can never happen to you. 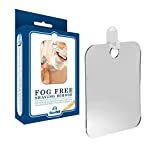 A fogless shower mirror will save you all that time, effort, and annoyance simply by preventing mist from forming. 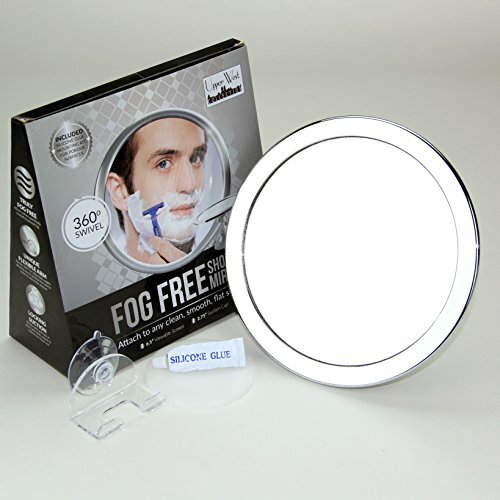 The best fogless shower mirror will also let you get a closer shave or a more thorough makeup job due to its quality. The fogging on clear surfaces is usually caused when showering with hot water in an enclosed area (e.g. your bathroom). A fogless shower mirror is a mirror that has some way built in for preventing water droplets from condensing on the treated surface. Condensation is what causes the fogging effect. These ways can include treatment with anti-fogging chemicals on the mirror’s silvered surface, or manually heating it up. Which is better? The best fogless shower mirror for you depends on your preferences. Our Top 5 picks for the best fogless shower mirrors are based on our research and testing, backed up by the experience of hundreds of real-life customers just like you. The ones listed here are all worthy, but read our reviews to find out their pros and cons and decide which best fits your specific needs. If you are looking for a BIG shower mirror and don’t want any of those small-sized things you see in the stores, then Mirror On A Rope’s XL-sized mirror may be just right for you. It’s sized at 7.6″ x 5.6″ and is bigger than most fogless mirrors being sold. The distributor’s name seems to be a play on words because this mirror DOES come suspended on a rope. Unlike most that are fixed to bathroom walls using suction cups, this one hangs from a 5.5 foot paracord. The paracord is very strong and can even hold a 113.2 lb weight. One advantage of a hanging mirror is that you can move and reposition it anytime you want, especially if you want to use it in different room. ReflectXL is fog-free and shadow-free. It is made from aircraft-grade acrylic that is more expensive than glass. The result is a very clear reflection and a mirror that will last you years and years. This is designed, fabricated, and packaged in the USA. This comes with a hook and a paracord. Simply attach the hook where the light is best in your bathroom and then slip the paracord through it to hang your mirror. You can adjust the rope to the desired length. To clean, the instructions say to use water and a clean bath towel. I find that microfiber cloth works as well, or better. This comes with a full return policy. The company appears to provide replacements as evidenced by other people who have bought this. Their customer support appears responsive. Upper West’s shower mirror is round in shape with a rotating suction lock. The rotating holder is especially useful as you can turn it any which way while shaving or putting on makeup. Its small size allows it to be brought along while traveling. It’s much smaller than ReflectXL but it makes up for it with the magnification feature. Cautionary note: According to reports, it stops being fog-free after a couple of months. Jane has bad eyesight so when we buy mirrors, we usually buy those things that swivel with magnification on one side. We liked Upper West’s because of the 2x magnification. It’s especially useful for seniors or for those who simply want to see their face bigger and with more detail. This company will be coming up with a 3x magnification very soon so I’m watching out for that. This model comes with a suction lock. If you have a smooth and glass-like surface, this suction should work as designed. All you need to do is to clean the surface and then twist the lock clockwise to lodge it in place. However, if you have a bumpy or porous surface, you’ll be hard put to keep it sticking to the wall. Instead, use the plastic disc that is included in the box. It is an alternative way to mount. It comes with a silicone adhesive but you can use your super strength adhesive strips for stronger grip. 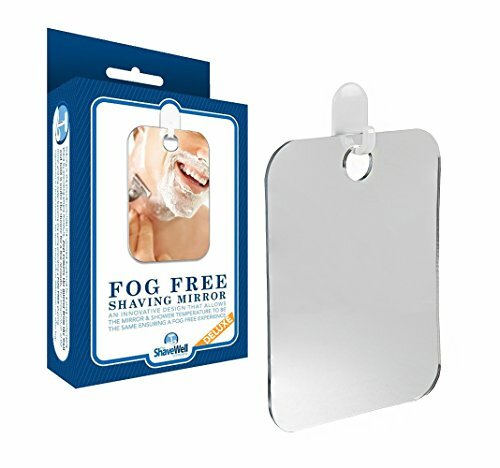 Could Shave Well’s offering is the best fogless shower mirror for shaving? Keep scrolling, gentle reader. This mirror is 6.83 x 5.25 inches in size, so it’s small, but perfect for shaving while under the shower. There is no choice in frame color because it actually has an interesting design whereby there is no frame. The best description for it is that it looks like a short, wide dogtag hanging from a hook. This lack of frame isn’t as dangerous as it sounds because it’s made of plastic, similar to some of the fogless shower mirrors we’ve looked at so far. The plastic construction means that it won’t give you a reflection quite as razor-sharp as a glass mirror might, but it also will be a lot lighter for moving around (see why you’ll need to do under the Noteworthy section) and is immune to shattering if you drop it. This is Amazon’s Choice for shower mirrors. There are three noteworthy elements about Shave Well’s fogless shower mirror, and they could well make it the best fogless shaving mirror. First is that the mirror operates on basic science. You detach it from its hook and hold the mirror under the hot shower stream to warm it up. Once it’s warmed up, the mirror’s temperature will ensure no pesky condensation fogs up its surface. You can then put it back on the hook and use it. This basically operates on the same principles as ToiletTree’s heated water mirror, except that you soak this mirror instead of filling it with water. Could this get annoying to do? Possibly, but it doesn’t really seem like a hardship to just unhook the mirror and run hot water over it before rehooking it. Second to note is that in order to clean this mirror, you wet it and then wipe it with toothpaste. This will keep droplets away from your mirror. The third noteworthy element doesn’t relate to the use of the mirror at all, but may be of interest to you. 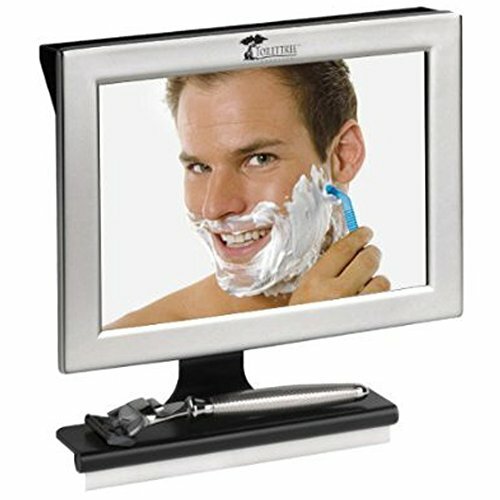 This Shave Well fogless shower mirror (and its fellow Shave Well mirrors) are not made in China. Instead they are made in the USA and are assembled at Sunshine Industries, a vocational training facility in Tennessee for people with disabilities. It’s a nice human interest element to keep in mind. This comes with a plastic hook that you stick on the wall with adhesive (packaged with it). You then hang the mirror on the hook. The easy detachment from the hook is required for its regular anti-fogging soak. We are so confident you will be pleased with your product that we don’t do returns. Just kidding. If you’re not completely satisfied with your purchase, you can return your order for a full refund. We will do whatever is necessary to make sure you are ultimately happy with your transaction. Further, on the back of every mirror is the phrase “We stand behind our products 100%…without question or excuse” with an email address and phone number to take them up on that promise. Like other models, it flips and rotates 360 degrees. There are two noteworthy things about this ToiletTree mirror that I want to talk about. The first is the quality and durability on this thing. We eventually settled on a ToiletTree mirror after realizing that the one in my friend’s house is more than FIVE years old. It may look a bit frayed around the edges but the mirror is still looking great. I did not notice any discolorations or foggy films. It looks great, works, great, and will last years. The second is the awesome customer support. I can’t talk about your future transaction with them but based on experience, this company goes over and beyond the call of duty. They provide extra silicon adhesive upon request and you may even get a letter from the owner of the company himself. This mirror doesn’t come with a suction cup (which I hate) but comes with strong double-sided adhesive tape. It can latch on to most, if not all bathroom surfaces securely. A squeegee is packaged along with the mirror and you can swipe it across before each use to keep the mirror clean and free of water drops. The Fogless Shower Mirror by ToiletTree is the top of our rankings, and the most popular in the market – it could well be the one for you. It’s rectangular and sized 8.5 x 2.6 x 9 inches. For frame color, you can choose from 3: Black, Silver, and White. It comes with a squeegee (yay). It also has a built-in shelf where you can keep shaving accessories or skin care materials for easy access. The mirror is entirely made of shatter-proof high-quality acrylic (otherwise known as plastic), including the reflective portion. This isn’t a bad thing, just something to note so you know what to expect. The clarity of this fogless shower mirror may not be as razor-sharp as its glass counterparts, because plastic just won’t be as perfectly smooth. However, this plastic mirror will also never break. No shards, wasted money, or 7 years of bad luck! ToiletTree guarantees that it won’t rust, stain, or otherwise damage your bathroom door or wall (wherever you hang it). This mirror also has a lighted and a travel version. 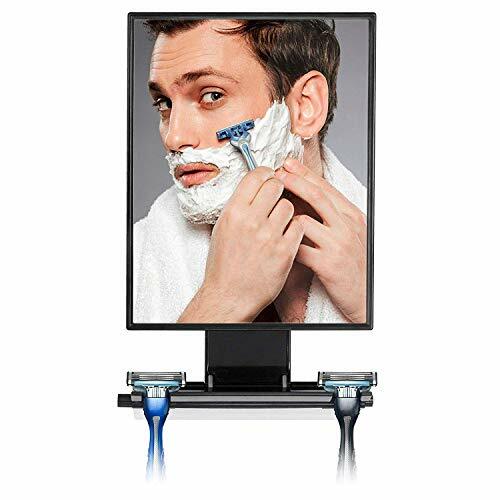 The Deluxe LED Fogless Shower Mirror by ToiletTree in particular is a very good alternative. Its main difference from the vanilla (basic) version is that it’s 20% larger and has LED lights illuminating its frame for a brighter view when you’re using it. Get a much better look at stray hairs to pluck, blemishes to cover up, and an up close view of your pores! This is Amazon’s Choice for fogless shower mirrors. This fogless shower mirror by ToiletTree works in a curious way. The back of the mirror has a water chamber specifically meant for you to fill with hot water before each shower. The idea is that the hot water keeps the mirror at the same temperature as your bathroom once the hot shower gets going. The mirror then will not fog up, since condensation cannot form on a surface that’s equally hot. The structure makes it easy by letting you slide the mirror off the bracket for easy access to the water chamber. That squeegee it comes with that we mentioned earlier? This is where it comes in. You use the squeegee to wipe off the mirror right after filling it with hot water. It will then retain its clarity for as long as the water in it remains hot. Is it a hassle having to do this before every shower? It could be. But it’s not a large price to pay for a perfectly fogless shower mirror. And the advertised 5-7 seconds it takes to fill the reservoir are still quicker than the time spent waiting for a fogged-up mirror to clear. If this sounds good, go and check the availability right away. 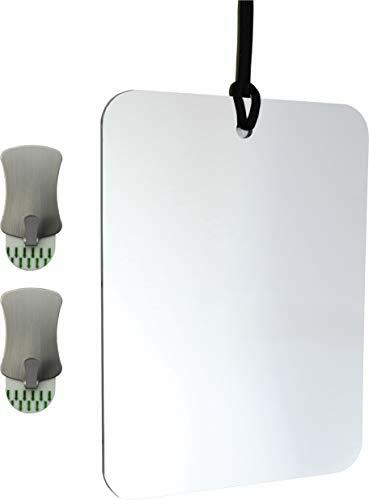 This fogless shower mirror comes with removable silicone adhesive and double sided tape. It sounds pretty flimsy, but this mirror isn’t very heavy (13.4 ounces, in fact) as it’s essentially made of plastic. ToiletTree offers a 100% 30-day money back guarantee on this product.